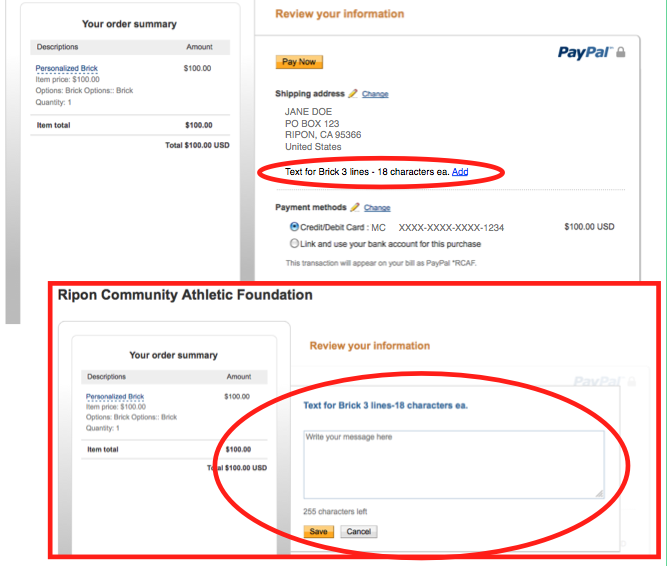 You will have an opportunity at the PayPal website to choose the quantity or number of bricks you wish to purchase. Logos/Artwork will be handled separately. *Please see important note at the bottom of this page about purchasing custom bricks online. If we sell 1,220 bricks we can generate upwards of $100,000 towards a revitalized stadium for our community. Honor a family member, your high school record or alumni year, faculty member, classmate, or anyone special with a personalized brick. Great for birthdays, anniversaries, graduations, and athletic titles earned. An affordable way to participate in the revitalization project while creating a permanent memory. To order your own brick either print out our PDF order form or click on the “Buy Now” link above. After clicking the link to Buy Now, and you've logged into PayPal, the screen will show your name and address to the right of the shopping cart. Under your information is an area to add the custom wording for your brick: (Text for Brick: 3 lines/18 characters ea. Add). Click on the word Add. A pop-up box will appear where you can enter the text for your custom brick, to a maximum of 3 lines, with 18 characters (including spaces) per line.